music from the historical kiosks. It’s the right choice for a short-break with your partner or a holiday with your family. 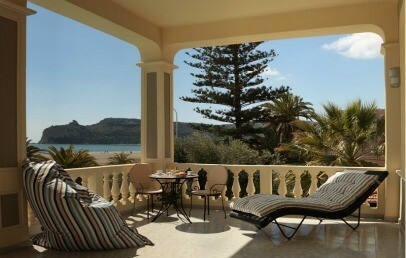 The Villa del Mare has an enviable location, just a few minutes from Cagliari city center, port and airport. The Villa overlooks the main beach of the city, Poetto, which extends about 8 km from the coast of Quartu S. Elena to the promontory Sella del Diavolo. During the summer, the long beach offers several bathing establishments where you can find sun beds, sun umbrellas and other services. Along the Poetto, kiosk-bars are opened over the entire year, proposing light lunches and drinks. During the evening, the beach is also ideal for an aperitif in front of the sea and to listen small concerts of local bands and much more. The pond of Molentargius, favorite place for pink flamingos, is located a short walk from the villa. For those who love sea cities, sun and nightlife, Villa del Mare is close to the center of Cagliari and a strategic point to reach loc. Chia, Villasimius, Costa Rei. Historic building dating back to the early 1900, that is born to new life after a careful renovation and is become a Charming Guest House. 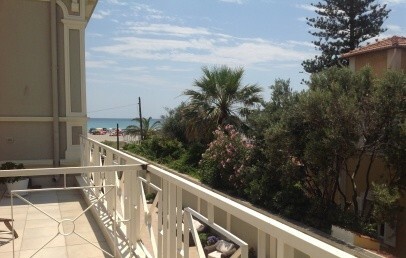 Only 20 meters separate it from the clear waters of Poetto. La Villa del Mare is furnished in Mediterranean in style and enjoys a splendid view over the Bay of Angels, in which it is located. The hotel does welcome guests from 12 years. 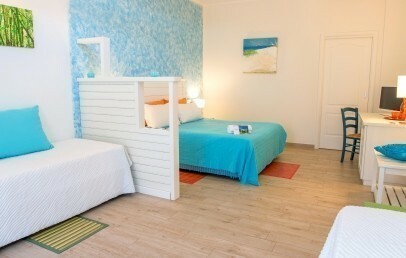 The rooms vary in their size and are furnished in a modern and comfortable way, according to a maritime style. The renovation was done giving particular attention in order not to ruin the charm of the original structure. All rooms offer a minibar, TV LCD, Wi-Fi internet connection, air conditioning, shower, hairdryer, courtesy set. 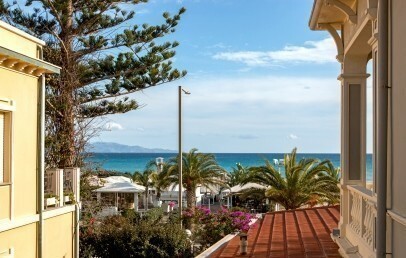 The Villa del Mare offers moreover nice Apartments with a surface of 60 or 70 sqm. They are comfortable and suitable for couples and families with children, even for long stays. 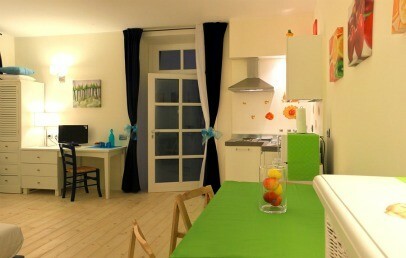 They are spacious and offer a kitchenette and can accommodate up to 4 or 5 people. They feature the following amenities: linens (sheets and towels), complimentary toiletries, hairdryer, heating/air conditioning, minibar, TV LCD, Wi-Fi internet connection. For all types of accommodations the treatment is room only. The management of the Villa del Mare is pleased to offer a complimentary Italian breakfast to the guests of the rooms, that is served in the wooden gazebo; instead have guests of the apartments self-catering. Further on request can be rent bikes or boat, surf equipment, organized several type of excursion, laundry service and many more. This room is on the ground floor with direct access on the side of the garden. 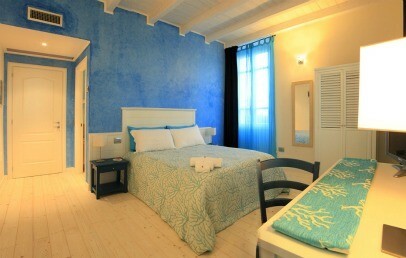 It is furnished in a fresh and comfortable style, in shades of blue that evoke the color of the sea. The bathroom has a shower and complimentary toiletries. 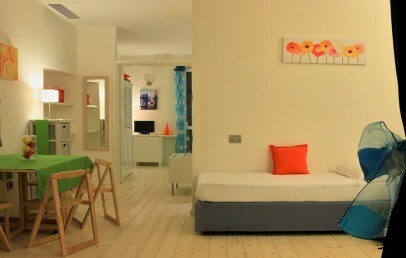 All rooms have a parquet floor, a desk and an internet connection Wi-Fi. Breakfast offered from the management. 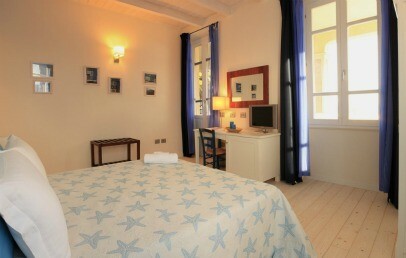 Rooms located on the ground floor with access from the garden of the Villa. 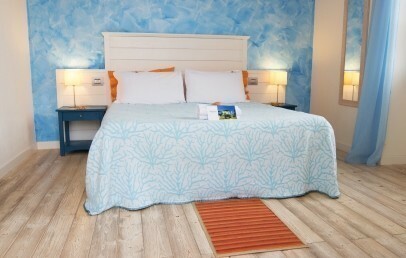 Furnished with a fresh and comfortable style, in shades of blue that evoke the color of the sea. Private bathroom with shower and complimentary toiletries; internet Wi-Fi. All rooms have a parquet floor and a writing desk. Breakfast offered from the management. Apartment located on the ground floor, furnished with a fresh and comfortable style, in shades of blue: bold, solar colors, recalling the sunshine and the joy of the warm and carefree summer days. It is composed by a bedroom, a kitchenette; it disposes of private bathroom with shower and complimentary toiletries; internet Wi-Fi; parquet floor and a writing desk. It includes arrival and departure cleaning, linens and towels, blankets. Apartment located on the ground floor, furnished with a fresh and comfortable style, in shades of green: bold, solar colors, recalling the sunshine and the joy of the warm and carefree summer days. It is composed by a bedroom and a kitchenette; it disposes of private bathroom with shower and complimentary toiletries; Internet Wi-Fi; parquet floor and desk. It includes arrival and departure cleaning, linens and towels, blankets. Room located on the first floor. 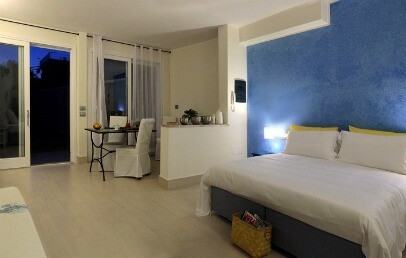 Furnished with a fresh and comfortable style, in shades of blue that evoke the color of the sea. 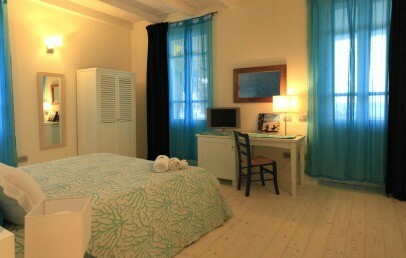 Private bathroom with shower and complimentary toiletries; internet Wi-Fi; terrace with view on the sea. All rooms have a parquet floor and a writing desk. Breakfast offered from the management. 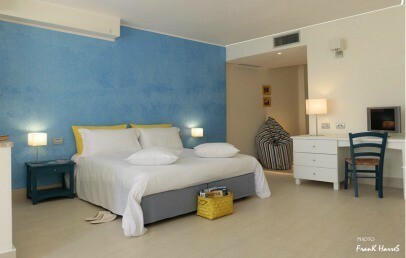 Room located on the first floor, furnished with a fresh and comfortable style, in shades of blue that evoke the color of the sea. Private bathroom with shower and complimentary toiletries; internet Wi-Fi; equipped balcony with sea view. All rooms have a parquet floor and a writing desk. Breakfast offered by the management. The room is located on the first floor of the Villa del Mare and is furnished in a fresh and comfortable style, in shades of blue that evoke the color of the sea. The bathroom has a shower and complimentary toiletries; an internet connection Wi-Fi; a comfortable terrace from where view is towards the sea. 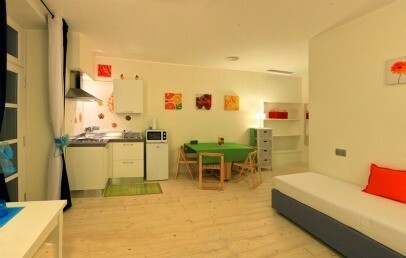 All rooms have a parquet floor, a sofa bed and a desk. A small breakfast is offered from the management. The rooms are located on the ground floor. They are decorated in shades of blue that evoke the color of the sea. The bathroom has a shower and complimentary toiletries; internet connection Wi-Fi. 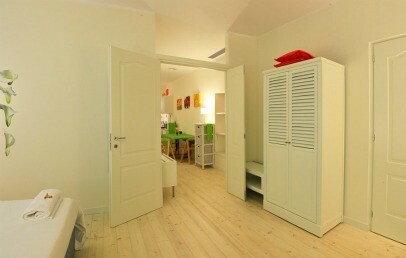 All rooms are comfortable and have a parquet floor, a sofa bed and a desk. They can accommodate up to 3 people. A small breakfast is offered from the management.